Mature males sport odontodes, which are bristle-like extensions, on their cheeks. This is a peaceful and inactive bottom dwelling fish that should not bother its tank mates. 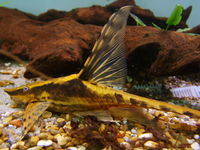 Keep with similar sized peaceful community fish.Keep with smaller fish but not to small because the small fish will eat the things on the end of the tail but do not keep with fish that are to big because their slim tail will get bitten off. They will accept a wide range of foods including and not limited to: blanched zucchini, live/frozen bloodworms, catfish pellets and crushed fish flakes. Loricariids can go for long without eating, and this fish is no exception. In order to keep in good condition, however, feed at night before lights are turned off as they are nocturnal and will be at their most active during the night.